The vision for this project is to engage the church with the waterways communities. These communities are the boaters; they include live aboards, continuous cruisers, leisure cruisers, walkers, runners, fishermen, waterside residents and businesses. John and Nicola Clark moved their narrowboat to Hartford Marina recently and so John is working to establish the Waterways Chaplaincy in this area with the blessing of the Environmental Agency. The boats on the river in summer look idyllic, but, as in all communities, there are down times. People who live or spend leisure time on boats experience bereavement, loneliness, stress, marriage breakdown, ill health and financial difficulties. John needs people to become involved: to adopt a marina and a public mooring in their area and commit to visiting at least once a week so that they build up relationships with the boaters. This is being Christ in the community: befriending people of faith and no faith, listening, pulling in resources through the senior chaplains where necessary, sharing one’s faith when given the opportunity. If you would like further information please either call John on 0776 7362084 or email clarkjh@live.co.uk. Hope Cambridge with Cambridge Street Pastors are pleased to announce that the trials of The Safe Refuge (held over the last 2 years) were successful and confirmed the need for such an initiative. Over the pilot periods they offered care, a listening ear and practical help to hundreds of people out in Cambridge during the night time hours either enjoying themselves or working. With this in mind they are now preparing for the Safe Refuge to begin on a permanent basis every Saturday night (10pm – 4 am) from this summer. Safe Refuge is therefore recruiting for its Volunteer Care Team. A caring nature and a heart for people along with an ability to stay awake are all that’s required, as there will be adequate training provided. If you are over 18, belong to a Church/Fellowship and can provide 2 references, one of which needs to be your pastor/minister then do think about whether God is calling you to be part of this work for his Kingdom. This is the short video we watched at out AGM in March 2013. Do you ever shop on the internet? If you do, here is an opportunity to raise money for charity by doing what you already do and at no cost to yourself. 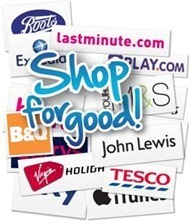 Give as You Live is a scheme whereby any one of 2200 merchants will give up to 5% (typically 1-3%) of the purchase price to a charity of your choice. In return they have the opportunity to send you one e-mail a week suggesting stores with whom you may wish to shop, which of course you are free to ignore and do nothing differently than you did before! All you have to do is download software which pops up with a banner when you enter a site which offers the charity donation. You then choose to click on the banner to activate the software for that site on that visit. Thereafter everything is automatic and the charity donation is collected by GAYL and passed on to the charity. The link below will allow you to download the software in order to support GBC, but at any point you can choose to change the charity you support to another – Cambodia Action (registered under the old, still official name of Southeast Asia Outreach), Anglo Indian Concern, Rehoboth Children’s Homes Trust and Mission Direct are all registered as recipient charities, as are most of the major national and international charities. This is part of a series from 2009 which explored the connection between Passion, Gifts and Personality. There are plenty of places to read the bible online—the best being BibleGateway and the increasingly popular YouVersion. a completely fresh approach to engaging with the Scriptures. When the Bible is always nearby, you can use any moment to read and share God’s Word. The Bible App has now been installed on more than 35 million mobile devices, and they are averaging about 2 million installs each month. It is probably the best bible reading app available at present. It is available for all mobile operating systems. The Android and iPhone apps are especially good; as usual the Symbian one leaves a little more to be desired! If you don’t already use YouVersion on a digital device, it comes highly recommended. Why not have a try at an on-line reading plan with YouVersion starting on 1 January? Our 5 young people (and Daniel Beckett and Joe George) were involved in the Beyond Belief initiative in Cambridge! They particularly helped with a Holiday Club – leading groups, and doing drama and games; prayer walked; and helped with a Youth Cafe at Great Shelford Free Church. https://godmanchesterbaptist.org/wp-content/uploads/2017/08/youth-header.png 0 0 Daniel Beckett https://godmanchesterbaptist.org/wp-content/uploads/2017/08/youth-header.png Daniel Beckett2011-11-17 16:09:322011-11-22 00:22:52Beyond Belief: The Video!